For Those Who Appreciate The Power Of A Truly Blank Canvas. It’s time to think about print in a whole new way. You can do full color static short-runs all the way through dynamic marketing programs using data-driven assets with quality that rivals traditional offset. Designers are no longer confined by traditional print limitations. For the last decade we’ve focused on not only changing what’s possible, but how and when it’s possible – for an overall lower bottom line to the customer with potential for increased ROI. This is an advantage for any client whose primary goal is achieving more with less. 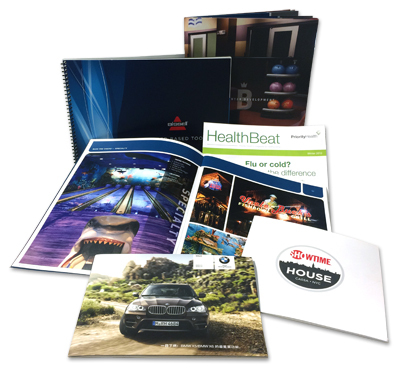 No matter how you choose to use our digital printing technology, we’ll help tell your story. High-volume, short-run, on-demand and personalized print collateral are right up our alley. We have been doing it since 2004 for some of the biggest brands in the world, utilizing our fleet of HP Indigo's, HP Color Inkjet's and Xeikon presses along with our proprietary software technology. One advantage of digital printing is that it offers the look of traditional offset printing, in low quantities all the way through massive runs. Since our digital presses use ink instead of toner the quality is outstanding and perfect for just about any project. Another key advantage is that it allows collaboration between art and end-user through personalization. Our specialized team of data miners will assist in acquiring or scrubbing your data to ensure a truly unique and powerful advertising message. Not sure how to design a variable data project? We know taking full advantage of our variable capabilities may be overwhelming at first and that is why we have a team of specialists that will help you set up files, build templates, manage data, and even recommend design ideas. Suddenly, setting yourself apart just got a whole lot easier. Contact us today at (616) 534-8647 and ask to speak with a digital sales representative to get started, or use our request a quote form.